Does anyone know where I can find the book "A Candle to Light Your Way" by Mikail Strabo? I had seen it mentioned in one of the posts.I looked on Lucky Mojo, but didn't seem to find it. They do have "The Guiding Light To Power and Success" by Mikhail Strabo, however. It's out of print. I couldn't find a copy during a cursory search of used/rare booksellers online, sorry; it may be one of those that you just have to keep an eye out for if it's something that interests you. However, you're in luck. 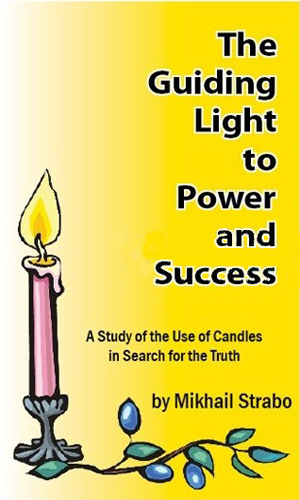 The entire text of "A Candle to Light Your Way" was included in Mikhail Strabo's second book, "The Guiding Light To Power and Success." Sorry if this is in the wrong place. I couldn’t find a thread for Mikhail Strabo’s other books. Does anyone know when (or if) Lucky Mojo will again offer for sale the book by Mikhail Strabo called: The Magic Formula for Successful Prayer? This book used to be listed for sale in the online Lucky Mojo catalogue, in the catalogue section listing the Grimoires, but currently it is not listed. Thank you for your time. A reply is appreciated. We hope to have "The Magic Formula for Successful Prayer" book back in print by the end of summer. Thank you, catherine yronwode, for your reply to my post. I actually have the book for many years, I was trying to light a red candle with the prayer in the book and realize that the psalm number to read right after you pray was erased. Can anyone help me with that I know it start with 1 but cannot seem to make out the rest of the number.